Let’s face it: When it comes to finding ways to save money, brown bag lunches usually get a boring rap. But homemade doesn’t necessarily have to mean ho-hum. If you’re working at a regular full-time job, one way or another you’re probably eating lunch away from home five days a week. If you hit the regular soup and sandwich place every day – or worse, if you’re eating fast food five times a week – you’re going to pack on pounds and drop a lot of cash. As an example, imagine that you’ve found enough coupons and local specials to keep your daily lunch cost to $5. That’s a very low estimate, especially if you work in a city or major suburban corporate park. Even at that seemingly low price, you’ll spend $25 per week, $100 per month, and $1,200 per year. That’s not even taking into account the costs involved in getting to where you eat. If you drive just three miles to your favorite lunch spot, you can add about another $225 to that yearly amount. On top of that, consider the wear and tear on your car for that short stop-and-go trip around the block. I take my lunch with me to work just about every day of the week, and no, I don’t really use a brown bag. I endured a stare or two at the beginning, but if you think you’re suffering a stigma for bringing in your own lunch, you’ll just have to summon a little courage and know how much money you’re saving. I don’t avoid the social situations of the office. I’ll go out to eat on rare special occasions. If you like spending time with co-workers, designate Fridays to go out to eat, but pick a place where you can regulate how much you spend. Find a place with a lunch special or come up with restaurant discounts and coupons you can use. Additionally, you can encourage a few co-workers to bring their lunch to work, and eat together outside or in a break room. Make an event out of it, and you can all support each other in an effort to cut lunchtime spending habits. 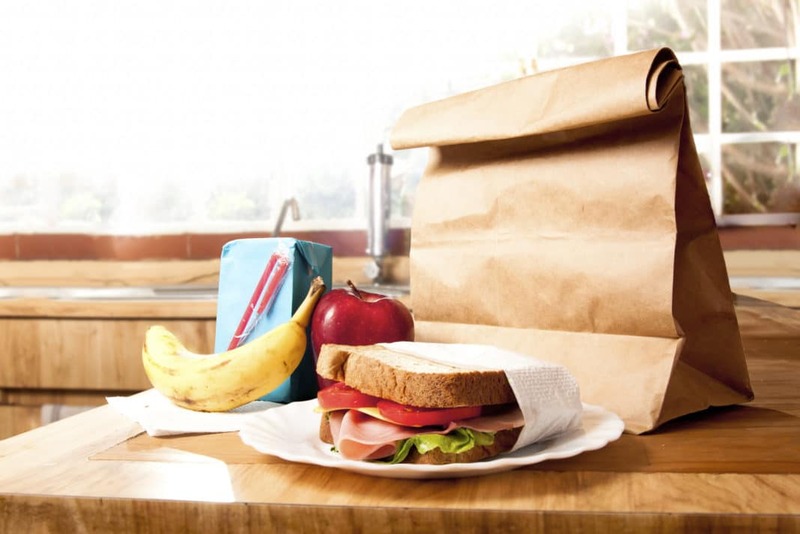 To avoid getting bored with your own meals, and to attract the attention of a few co-workers, follow these seven steps to up the ante on brown bagging it. You may even get healthier and make your colleagues jealous in the process! A small bag of carrots and celery sticks isn’t too exciting – until you add garlic hummus or sweet Thai chili sauce. Tasty dipping sauces can spice up everything from leftover grilled chicken (cut into nugget-sized pieces), pre-cooked shrimp, and fruits and veggies. Just pick your favorite flavor pairing, use quarter-pint canning jars for the sauces, brown bag it, and you’re good to go. Your taste buds will thank you. Don’t be afraid to try new flavor combos and discover a new sensation. Sure, expensive taste might add a few extra dollars to your immediate budget, but these toppers will last longer and cost less than the instant gratification of a restaurant lunch. If you’re bringing a small thermos of soup to work for lunch, toss in chopped scallions, homemade croutons, or even a dollop of yogurt to take lunch soup to the level of restaurant indulgence. These items are all affordable options to freshen up your soup even on the tightest of budgets. Small containers of homemade trail mix, sandwich bags of bargain pretzels that you buy in bulk and custom-season in the oven, or even a couple of homemade cookies will give you something to look forward to at lunch or during a coffee break. Anything to break up the monotony of your sandwich and apple combo will make that brown bag a little less boring. Is there anything more fun than eating with your hands, rather than using a fork? Homemade turkey roll-ups sliced into bite-sized pieces, fresh spring rolls, and veggie kabobs are just a few ideas. Combine them with a yummy dipping sauce and you’ll double your fun factor. If you’re tired of PB&J sandwiches, but you don’t have time to whip up a gourmet meal every morning, consider cooking large batches of delicious entrees that freeze well, like lasagna or chicken pot pie. Put them into single-serving Tupperware dishes, pop them in the freezer, and then grab one on your way out the door to work. Voila! A hot, home-cooked meal that’s a fraction of the price of take-out! Similarly, last night’s dinner works as a great lunch and takes very little prep time. If you get tired of repeat meals, buy yourself some flour tortillas, wrap last night’s protein leftovers up in one of those with a little bit of cheese, and have a wrap. Or throw together some old school sandwiches, which always do the trick for me. Finally, last night’s salad won’t have a long shelf life in your fridge, so add some dressing and bring it to work the next day for a filling, nutritious meal. You may not realize it, but very few sandwich shops and restaurants are truly healthy options. Going out to lunch probably doubles or triples your calorie intake, as well as your fat and cholesterol levels. When you bring your own lunch, on the other hand, you know exactly what is going into your food. Since a full-time job or working multiple part-time roles can cut into your workout time, monitoring your nutrition is even more important. If you’re trying to cut calories to lose weight or just stay in shape, bringing in your own lunch will make a world of a difference. The cost of a turkey rollup or carrots-and-hummus combination might vary greatly depending on where you shop and what kinds of specialty ingredients you might choose to buy. Leftovers are very inexpensive for sure, and if you look for the right deals at your local grocery store (i.e. extreme couponing), lunch meats are quite cheap too. In the end, the daily cost of making your own lunch should average out to around a dollar a day. That’s roughly $1,100 in annual savings: about three car payments or a month or more of your mortgage or rental payments. For all the stares I got from co-workers, three of them already caught on to the savings and they’re doing the same thing I’m doing. Brown bag lunches are the ultimate way to save money, but they don’t have to taste as cheap as they are. With a little planning and experimenting, you can tantalize your taste buds while keeping your money where it belongs – in your wallet. What are your thoughts on bringing a brown bag lunch to work instead of eating out everyday?